This WeTest meet-up was held at the AIG offices in downtown Auckland during tech-week, an industry-led event focusing on tech innovation in New Zealand. 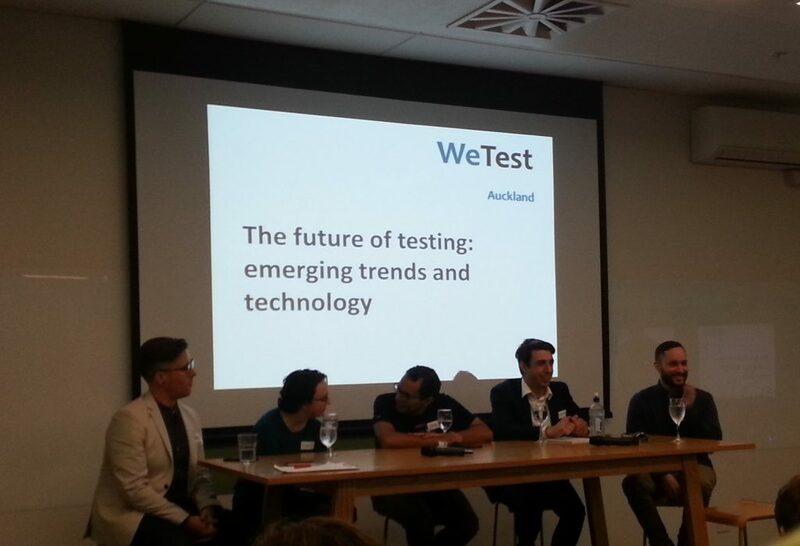 The meetup featured a six-member panel consisting of some of the New Zealand tech community’s finest, discussing their experiences and thoughts on the future of testing. 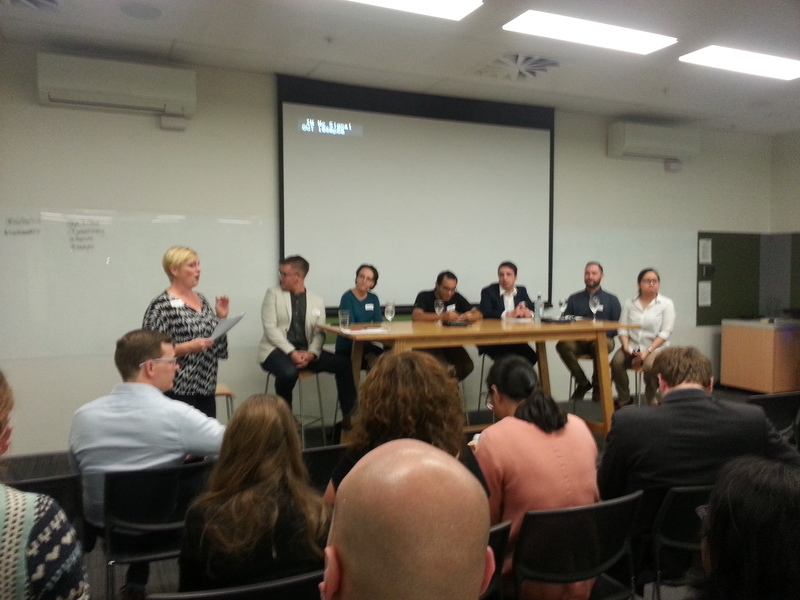 Discussion was led by moderator and organiser Shirley Tricker from Elementum. Dexibit is a startup which has existed for less than two years. It ‘helps surface information’ on visitors to places, such as museums, providing insights such as how to best co-ordinate their collections and justify their government funding. It uses beacon technology with Wi-Fi and Bluetooth as well as social media and weather information as data sources. Auckland art gallery and Te Papa acted as beta-testing sites during the initial development phases. Focuses on how smart-test automation and dev-ops fit in to the Continuous delivery pipeline. Called Quality Assistance and are involved right from the beginning. Whole vocabulary has developed, such as worming, (works on my machine), and (release) carriages. Ian Randall has spoken about this and there are videos available online (link tbc). Leads cross-functional teams. Inspired by the Spotify videos. Self-organizing teams. Important to break down barriers. Team sizes from 3 – 9 people. Focus on the testing mindset, tools + pipeline /= quality. Ownership on quality important. James is a futurist, which he defined as identifying and extrapolating trends, then applying them to our lives and specifically (in business) what those trends mean for the business and what the business is going to do about them. Part of James’ role is capability development, which for him involves coaching on lean etc. and self-organizing. Enables and accelerates continuous deployment, not just the tools but the mindset also. Goat Ventures is a startup which is developing a legal artificial intelligence, jokingly called a robot lawyer. Shirley asked what the difference between machine learning and AI is, Joe responded that this is a common question and that Machine learning is a type of AI. How he got to the role he’s in now, was starting as a software developer, noticing he was attracted to AI made the decision to focus on that. 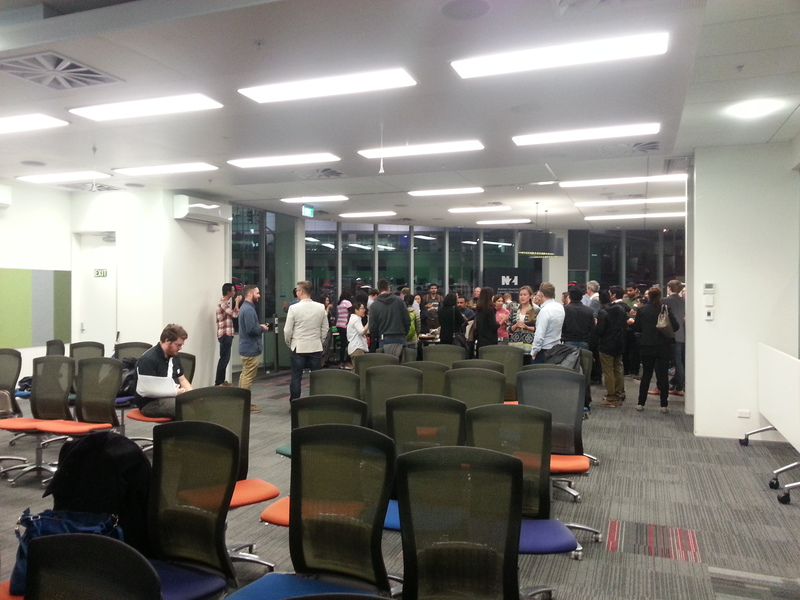 Started and organized the Auckland AI meetup, which both made him accountable to others which ensured he’d research and come up with new material for the Meetups, but also spawned the connections that led to his current role. Prior to starting at Goat Ventures, Joe worked at Xero, where owing to the MeetUp they noticed his interest in AI and formed an incubation team around him to research the possibility of adding AI capabilities to the Xero product suite, specifically around identifying risky trajectories and providing useful interventions to avoid getting in to trouble. Joe’s key ability is to “Productionize AI” i.e. take AI out of the lab and in to working software. Test automation and behavior driven development. Michelle is a professional tester in Air New Zealand looking after the internal application that empowers cabin-crew and pilots. Air New Zealand is not a digital company and in the past have used third-parties to deliver software, however they have recently recognized that the digital space is critically important, and are bringing dev back in house. They’re currently starting in the process of implementing agile and continuous delivery. Here are some verbatim notes I made during the presentations. They may contain errors, which I’ll happily correct if you comment or contact me directly. Joe says the split between manual and automated testing is important, as it requires expert judgement to identify failings, for example bias in model training. Google’s AI expert Peter Norvig describes a ‘panel of judges’ approach to remove bias at this link. Hadi pointed out that continuous delivery was Utopian, an idealization, and definitely not required for all projects. He gave the example of being the product-owner on an experimental development where the team wanted to over-engineer the prototype. He spoke to having an innovation budget on projects, making every project a little bit different and therefore interesting to the developers, for example not using a test environment just monitoring in production. James less roles manually testing however balanced by new roles e.g. product owners, quality from a user / customer lens. Started out as a tester, moved on to program test lead. New role as iteration manager looking at cross-functional teams. Michelle encourages manual testers to upgrade to auto but stick to your talents, B.A., product owner or QA engineer – mobile automation. Automation everywhere more and more. Medical tech and education tech are opportunities. Linda PushPay PCI compliant so therefore use third-party penetration testing. Adam the Internet of Things (IOT) needs manual testers, for example verifying the reported and actual location matches up. Shirley reminds us that the WeTest conference is coming up and that it sold out last year, so we better hurry up and get tickets if we want to go.